None of the communications made through this Site should be construed as an offer to sell any Fish Window Cleaning franchises in, nor is any such communication directed to, residents of any jurisdiction requiring registration of the franchise before it is offered and sold in that jurisdiction. No Fish Window Cleaning franchises will be sold to any resident of any such jurisdiction until the offering has been exempted from the requirements of, or duly registered in and declared effective by, such jurisdiction and the required Franchise Disclosure Document (if any) has been delivered to the prospective franchisee before the sale in compliance with applicable law. If you should have any questions concerning the registration status of Fish Window Cleaning franchises in your jurisdiction, please contact John English at 1-877-707-FISH ext. 241 or by email at info@fishwindowcleaning.com. This Site, including all its Content are protected under applicable intellectual property and other laws, including without limitation the laws of the United States and other countries. All Content and intellectual property rights therein are the property of Fish Window Cleaning or the material is included with the permission of the rights owner and is protected pursuant to applicable copyright and trademark laws. The Fish Window Cleaning name and logo, all product and service names, all graphics, all button icons, and all trademarks, service marks and logos appearing within this Site, unless otherwise noted, are trademarks (whether registered or not), service marks and/or trade dress of Fish Window Cleaning (the “Fish Window Cleaning Marks”). All other trademarks, product names, company names, logos, service marks and/or trade dress mentioned, displayed, cited or otherwise indicated within this Site are the property of their respective owners. You are not authorized to display or use the Fish Window Cleaning Marks in any manner without our prior written permission. You are not authorized to display or use trademarks, product names, company names, logos, service marks and/or trade dress of other owners featured within this Site without the prior written permission of such owners. The use or misuse of the Fish Window Cleaning Marks or other trademarks, product names, company names, logos, service marks and/or trade dress or any other materials contained herein, except as permitted herein, is expressly prohibited. In consideration of your use of this Site, you agree that to the extent you provide personal information to Fish Window Cleaning, it will be true, accurate, current, and complete and that you will update all personal information as necessary. WE MAKE NO REPRESENTATIONS OR WARRANTIES WITH RESPECT TO THIS SITE OR ITS CONTENT, OR ANY PRODUCT OR SERVICE AVAILABLE ON OR PROMOTED THROUGH THIS SITE. THIS SITE AND ALL OF ITS CONTENT ARE PROVIDED ON AN “AS IS,” “AS AVAILABLE” BASIS, WITHOUT REPRESENTATIONS OR WARRANTIES OF ANY KIND. TO THE FULLEST EXTENT PERMITTED BY LAW, FISH WINDOW CLEANING, ITS AFFILIATES AND FRANCHISEES, AND THEIR SERVICE PROVIDERS AND LICENSORS DISCLAIM ANY AND ALL REPRESENTATIONS AND WARRANTIES, WHETHER EXPRESS, IMPLIED, ARISING BY STATUTE, CUSTOM, COURSE OF DEALING, COURSE OF PERFORMANCE OR IN ANY OTHER WAY, WITH RESPECT TO THIS SITE, ITS CONTENT, AND ANY PRODUCTS OR SERVICES AVAILABLE OR PROMOTED THROUGH THIS SITE. WITHOUT LIMITING THE GENERALITY OF THE FOREGOING, FISH WINDOW CLEANING, ITS AFFILIATES AND FRANCHISEES, AND THEIR SERVICE PROVIDERS AND LICENSORS DISCLAIM ALL REPRESENTATIONS AND WARRANTIES (A) OF TITLE, NON-INFRINGEMENT, MERCHANTABILITY AND FITNESS FOR A PARTICULAR PURPOSE; (B) RELATING TO THE SECURITY OF THIS SITE; (C) THAT THE CONTENT OF THIS SITE IS ACCURATE, COMPLETE OR CURRENT; OR (D) THAT THIS SITE WILL OPERATE SECURELY OR WITHOUT INTERRUPTION OR ERROR. FISH WINDOW CLEANING DOES NOT ENDORSE AND IS NOT RESPONSIBLE FOR STATEMENTS, ADVICE AND OPINIONS MADE BY ANYONE OTHER THAN AUTHORIZED FISH WINDOW CLEANING SPOKESPERSONS. WE DO NOT MAKE ANY REPRESENTATIONS OR WARRANTIES AGAINST THE POSSIBILITY OF DELETION, MISDELIVERY OR FAILURE TO STORE COMMUNICATIONS, PERSONALIZED SETTINGS, OR OTHER DATA. YOU ACCEPT THAT OUR SHAREHOLDERS, OWNERS, OFFICERS, DIRECTORS, EMPLOYEES AND OTHER REPRESENTATIVES, AS WELL AS OUR FRANCHISEES, SHALL HAVE THE BENEFIT OF THIS CLAUSE. TO THE FULLEST EXTENT PERMITTED BY APPLICABLE LAWS WE, ON BEHALF OF OUR DIRECTORS, OFFICERS, EMPLOYEES, AGENTS, SUPPLIERS, FRANCHISEES, LICENSORS AND SERVICE PROVIDERS, EXCLUDE AND DISCLAIM LIABILITY FOR ANY LOSSES AND EXPENSES OF WHATEVER NATURE AND HOWSOEVER ARISING INCLUDING, WITHOUT LIMITATION, ANY DIRECT, INDIRECT, GENERAL, SPECIAL, PUNITIVE, INCIDENTAL OR CONSEQUENTIAL DAMAGES; LOSS OF USE; LOSS OF DATA; LOSS CAUSED BY A VIRUS; LOSS OF INCOME OR PROFIT; LOSS OF OR DAMAGE TO PROPERTY; CLAIMS OF THIRD PARTIES; OR OTHER LOSSES OF ANY KIND OR CHARACTER, EVEN IF WE HAVE BEEN ADVISED OF THE POSSIBILITY OF SUCH DAMAGES OR LOSSES, ARISING OUT OF OR IN CONNECTION WITH THE USE OF THIS SITE. YOU ASSUME TOTAL RESPONSIBILITY FOR ESTABLISHING SUCH PROCEDURES FOR DATA BACK UP AND VIRUS CHECKING AS YOU CONSIDER NECESSARY. THIS LIMITATION OF LIABILITY APPLIES WHETHER THE ALLEGED LIABILITY IS BASED ON CONTRACT, TORT (INCLUDING NEGLIGENCE), STRICT LIABILITY OR ANY OTHER BASIS. 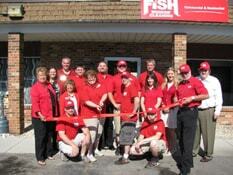 The terms “Fish Window Cleaning,” “we,” “us,” and “our” refer to Fish Window Cleaning Services, Inc.